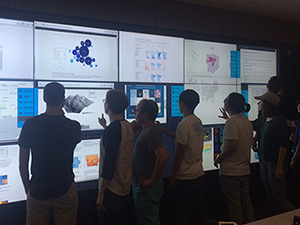 The GeoSocial Lab is home to research projects aimed at developing innovative computational and visual tools to better understand and analyze massive and complex geo-social networks. The lab is affiliated with the Department of Geographical and Sustainability Sciences and Iowa Informatics Initiative (UI3) at the University of Iowa and directed by Caglar Koylu. On this site, you will find links to research, publications and software focusing on developing new theories and applications for understanding massive geo-social networks. Sharing of research findings from diverse subject areas such as migration, spatial analysis of social networks, idea diffusion, political influence, disease spread and other analysis of social media data will help foster multiple perspective thinking and build a community that is particularly interested in combining theories and methodologies of diverse fields. We offer Master's and PhD degrees both at the Department of Geographical and Sustainability Sciences, and the interdisciplinary program at Geoinformatics. Graduate teaching and research fellowships, and assistantships are available for competitive students. Before applying, please contact Caglar Koylu with your brief research interests and CV attached. Competitive students will be invited for a Skype interview. The interview starts with a 6 minute, 40 second, a Pecha Kucha style presentation. Your presentation should focus on your current work, future research goals and interests, and how those intersect with the Lab's research agenda. Watch the seminar on patient mobility!